In economist’s James K. Boyce’s mind, we are currently facing a tragedy of the commons on the global scale. We have reaped the benefits of fossil fuels over the past centuries without paying for the consequences. The greatest being global warming. What is Boyce’s solution to this dilemma? A carbon price. In a recent study called Carbon Pricing: Effectiveness and Equity, Boyce makes the case for a carbon cap-and-dividend. A system which would assign property rights to the “limited capacity of the atmosphere to absorb CO2” and develop a sense of “co-ownership of the gifts of nature”. 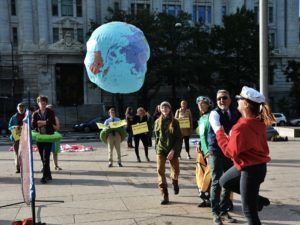 The study, published in April by the Political Economy Research Institute at University of Massachusetts Amherst, states numerous times that any carbon pricing mechanisms must be driven by emission targets, the capping of emissions, in order to drive them down, and for any prospect of meeting the goal of the Paris Agreement – keeping global warming below 1.5 – 2 ℃. However, there are several things to keep in mind in order to ensure that such a policy is both effective and fair. 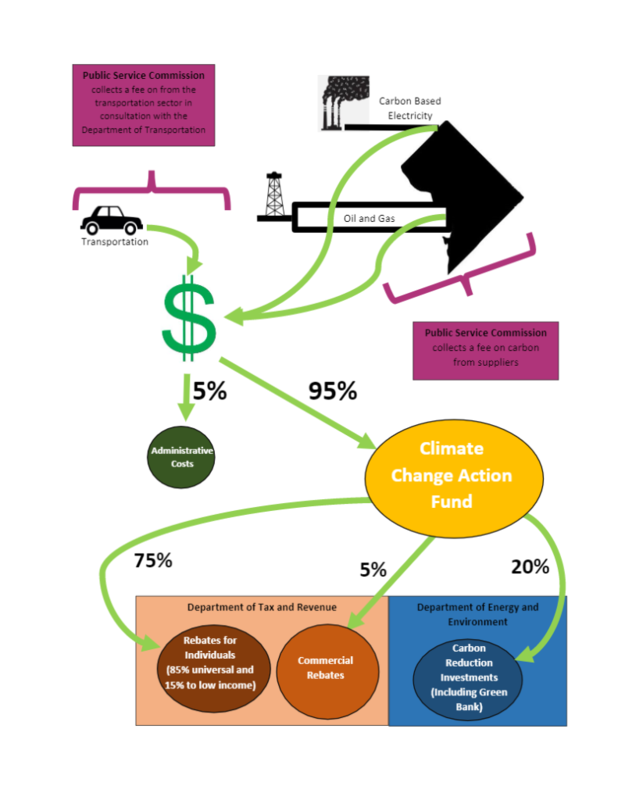 Global carbon pricing mechanisms today cover about 20% of fossil fuel emissions. However, they were found to be falling short of their goals due to the prices being too low. Incredibly, after taking into consideration the subsidizing of fossil fuels, the average net carbon price in the world today is minus $8. This is partly due to that three-fourths of global carbon prices are set below $10 per metric ton of CO2. These prices are well below the recommended level. According to a study (Nordhaus), cited by Boyce, the price required to stay below 2.5 °C warming starts at roughly $230 per metric ton of CO2 in 2020, increasing over time. This makes the DC price of $20 per metric ton with increases of $10 per ton every year with a cap at $150 in 2032 seem modest. However, our carbon price will be occurring in conjunction with improvements in energy efficiency and an increased renewable energy portfolio. These simultaneous actions assist in bringing down the necessary carbon price. How do you ensure it is fair? One concern of increasing pricing to the necessary level to invoke timely change is the impact that will trickle down to ratepayers. This effect was referred to in the study as the “cost pass-through”. Boyce states that this pass-through is “a predictable and desirable feature of carbon pricing” because it signals users to reduce their carbon footprints. The lower your footprint, the less you pay. substantial share of the carbon rent is rebated to the public as equal per-person dividends, the net impact of the carbon pricing policy turns progressive. 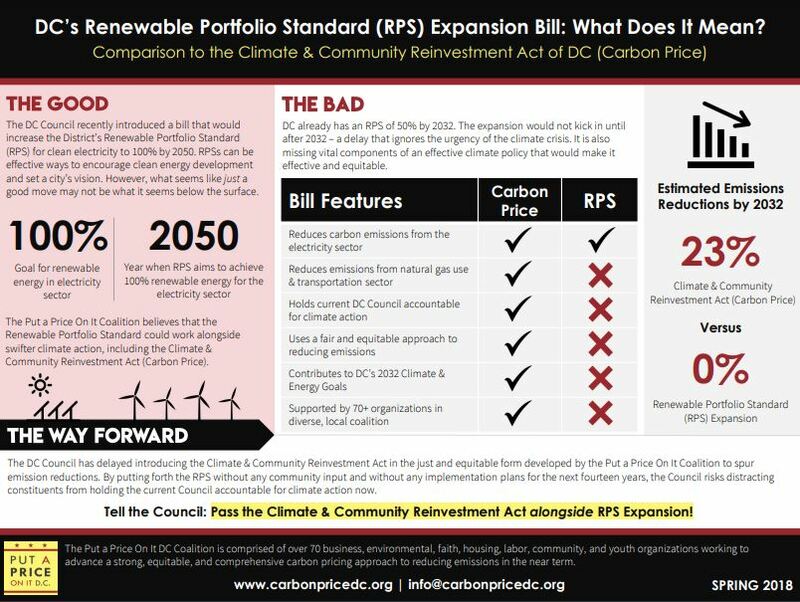 This method and theory will, hopefully soon be put into practice through the Climate and Community Reinvestment Act of D.C. 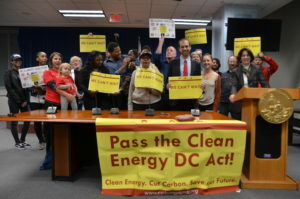 The proposed policy would reinvest a large portion of the revenue raised back to D.C. residents, with portions also allocated into energy efficiency and renewable energy programs and tax cuts for small businesses. What makes the rebate fair? It is important that a carbon fee-and-rebate takes into account that every household does not have the same carbon footprint. This is a factor which must be adjusted for when establishing the rebate mechanism. Simply put – those who consume more pay more, and those who consume less pay less. Sound familiar? One of the best mechanisms we have to meet the goals of the Paris Agreement is carbon pricing. 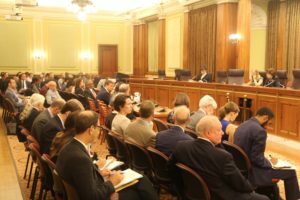 Methods like those studied by Boyce and put into practice by legislation such as the Climate and Community Reinvestment Act of D.C. are tools which are effective in reducing carbon emissions quickly, encouraging innovation and new technologies, and most importantly, done in a manner that is just. 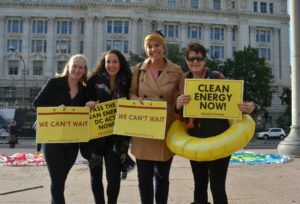 Courtney Dyson is a Communications Fellow at Chesapeake Climate Action Network. Image at top by Flickr user Hsing Wei, Crowded, 2009. Spring has arrived, yet we are still waiting on our carbon price and all the opportunity it will bring towards protecting our health and climate. In spirit of the cherry blossoms we are asking you to use your creative energies and submit a haiku on why we need a carbon fee-and-rebate policy in D.C.! We cannot wait any longer: we want to see the bill pass this year! Please submit your haiku entry by Friday, April 6. The author of the winning haiku will receive a prize from a local DC business. 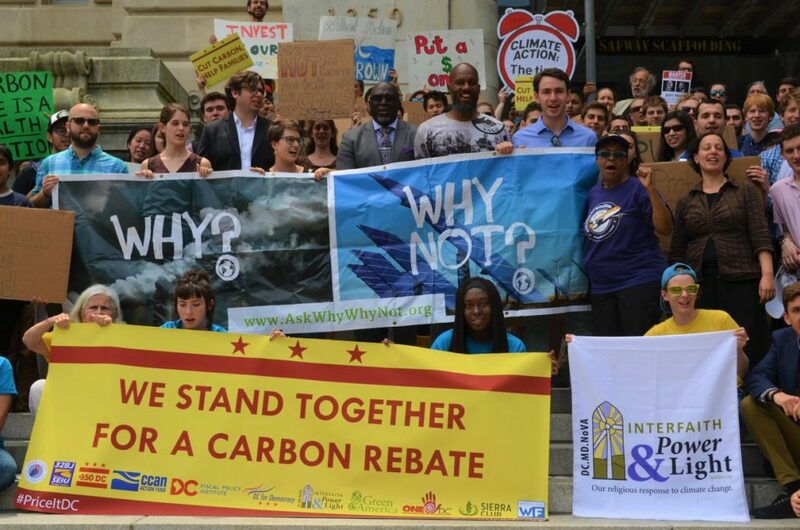 We’ll present the winning haiku during our Climate Day of Action on April 13!